With new standards on leasing released by FASB (Financial Accounting Standards Board) and IASB (International Accounting Standards Board), time is running out quickly for corporations reporting their rented real estate or leased equipment according to IFRS/ US-GAAP. Each of them will be impacted and is confronted with the new challenge to capitalize many operating leases and record these lease obligations on the balance sheet as assets and liabilities by January 2019 at the very latest. SAP has teamed up with partners like LEVERTON to present the latest cutting-edge solution to turn the legal challenge into an easy-to-handle solution. With automated extraction of key data from your lease files and a direct access to sync such data with an ERP system, LEVERTON and SAP are enabling a faster and easier transition. LEVERTON develops and applies disruptive deep learning technologies to extract, structure and manage data from corporate documents in more than 20 languages. Their platform empowers corporations and investors to be more efficient and effective with their real estate management. It facilitates quick and data-driven decision-making by creating actionable, valuable insights out of unstructured data. Their technology integrates into RE-FX’s “Contract Management” functionality for an efficient handling of US-GAAP ASC842 and IFRS 16’s requirements for a transparent building portfolio. The “Contract Management” functionality and its lease administration in RE-FX communicate with SAP Finance’s asset accounting, both being critical for proper classification and valuation. Sharing a common platform eliminates operational silos between these critical players making real property leasing more tangible for the corporation’s transition in the wake of IFRS 16 and US-GAAP ASC 842. 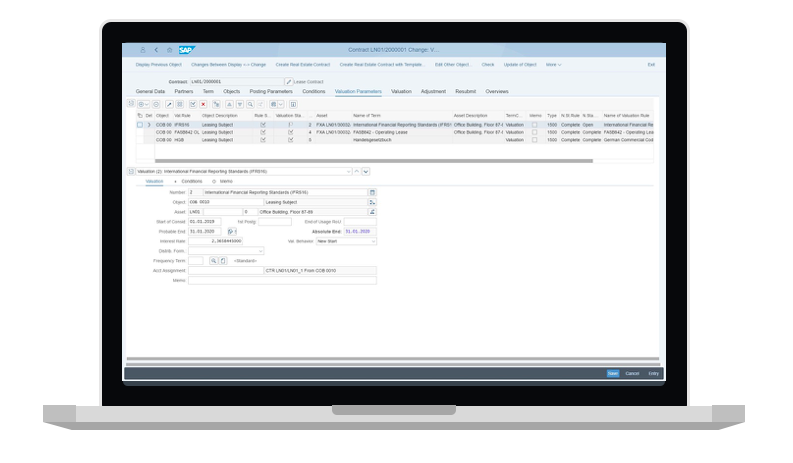 The “Contract Management” functionality can be accessed through the Fiori Launchpad for a personalized and simplified user experience. SAP Cloud for Real Estate, the latest addition to the SAP Real Estate Management portfolio which will be released at the beginning of 2017, will also integrate into RE-FX’s “Contract Management” taking advantage of LEVERTON’s technology and making sure IFRS 16 won’t be a nuisance to corporate real estate managers in the near future. Find out more about IFRS 16 on the SAP Community Network (SCN).